We’d love your help. Let us know what’s wrong with this preview of An Amish Garden by Beth Wiseman. To ask other readers questions about An Amish Garden, please sign up. What a quaint novella set! I really enjoyed this audiobook version. Thinking about the summer, this was perfect. I think I would prefer a full novel, instead of novellas. Thus a lesser star, but such a great set of books together and certainly loved all the little things in each book. They wrapped up sweetly! A sweet compilation for a summery read while working in the garden! In Planting a Future, it is a heartwarming story of true love. Rosemary is running her household since her mother passed and should be married with her own family by now. Saul has been her true love since they were 16. Will they now be able to give love a chance? Will Rosemary let Saul into her heart? In Seeds of Love, Sadie moved to Montana with her aunt and uncle after her parents died in a buggy accident. She decided to leave the area to avoid the daily memories of the pain she is feeling. The only connection she has left from her parents are her Mem's heirloom tomato seeds. She plants a wonderful garden but is meet with several challenges to help it thrive. Eli is the recent Amish traveling bachelor who is taken in by her aunt. Will Eli help Sadie save her family history? Will love bloom with them? In Flowers for Rachael, Rachael has a beautiful garden and loves flowers. Gideon is her neighbor that has fallen in love with her. Can Gideon win Rachael's love? Finally, in a Place for Healing, Emma is grieving the recent loss of her husband. She is living on a large farm with her eldery mother. The highlight of their day is working in the large garden. One day she discovers that a young Amish boy is living in her barn. Will she take him in? How will she deal with carrying for him and the future plans for her home? We have four Amish Novellas from four great authors. Each can be read alone . I think these authors have done some excellent writing on these novellas . You will read about love , hope, and trusting God through these novellas. After Rosemary Lentz mother died she takes over running the household for her father and siblings. She is good at everything except gardening . Rosemary was sixteen when she walked away from Saul , the man she loved and thought she would marry. Five years later Saul still has feeling for Rosemary and has no idea why she stopped seeing him. What did Rosemary learn that caused her to stop seeing the man she loved? You will love this story and I felt so sorry for Saul. Rachael Bontrager moved to Middlefield to take care of her grandfather after he had a stroke. Now Rachael has a beautiful flower garden, but she is lonely. Gideon Beiler is Rachael's neighbor and once he see's Rachael he falls in love with her. He cannot tell Rachael his feelings. Do you like matching ? Well you will read about some in Flowers for Rachael. I loved this story and it is romantic with the matchmaking that goes on. Sadie Camp has inherited her mom's heirloom seeds. She has a beautiful garden until something happened to it one night. Eli Plank has become her friend, but can she trust this traveling bachelor again with her heirloom seeds? Eli tells her he can help her. Will she listen to him and trust him with her heirloom and her life? This was a wonderful story to read and I loved it . Both Emma and her mother-in-law Mary Ann have lost their husbands. They share a home together in Shipshewana. ask Emma to take in a woman and her children. Now her mother-in -law Mary Ann has a secret about her garden that she has been keeping to herself for years. The two of them was contented with their lives , but now everything has changed. Will Emma ever find her place where healing blooms? I was given a copy of this book by the publisher and the author for my honest review. An Amish Garden is a collection of four novellas written by authors whose books I enjoy reading. The common theme in all the stories is, of course, the gardens. Each story was well written and a page turner in its own right. Rooted in Love by Beth Wiseman is a story of love and misunderstanding. Saul Petersheim and Rosemary Lantz had courted and were in love. Then, out of the blue, she broke up with him when she was sixteen. He had no clue what he had done to cause her to end the relationship. Th An Amish Garden is a collection of four novellas written by authors whose books I enjoy reading. The common theme in all the stories is, of course, the gardens. Each story was well written and a page turner in its own right. Rooted in Love by Beth Wiseman is a story of love and misunderstanding. Saul Petersheim and Rosemary Lantz had courted and were in love. Then, out of the blue, she broke up with him when she was sixteen. He had no clue what he had done to cause her to end the relationship. The fact was, he hadn’t done anything. Rosemary overheard a conversation between Saul’s mother and his aunt. That put a stop to that romance. Years later Saul and Wayne Lantz, Rosemary’s father, ran into each other pretty hard while running errands one day. Wayne had to stay off his feet for a time and Saul, even though his arm was in bad shape, offered to go over every day and care for the farm. Being around her every day and not having his love returned was difficult for him. What was the conversation she shouldn’t have heard? Why didn’t she ask Saul if it was true all those years ago? Can they put their relationship back together again? Read their story and find out! Flowers for Rachel by Kathleen Fuller is a story of love and learning to let others help you when you need it. Rachel Bontrager has a beautiful flower garden but that’s all she has. She left her home in Indiana to move in with her grandfather in Ohio. He’d had a stroke and she went to care for him. She missed her family and friends and was lonely. She was happiest in her garden talking to her plants. Hannah Lynn Beiler & her brother Gideon were a couple of Rachel’s friends. They were neighbors so she couldn’t very well ignore them. Gideon was in love with Rachel but she didn’t return the sentiment. Hannah Lynn tried to help him out in the romance department but that didn’t go so well. It was kind of comical actually. You’ll enjoy reading about the three friends and if anything blossoms between Rachel and Gideon. Seeds of Love by Tricia Goyer is a story of love, sharing and trust. Sadie Chupp left her Indiana home and moved to her Aunt and Uncle’s home in Montana after the death of her parents. She took with her the only things of her parents that she owned…her mother’s heirloom tomato seeds and her gardening journal. Gardening was a bit different in Montana than it had been in Indiana. The soil was different and so were the temperatures. She was going to grow her tomatoes though. Eli Plank was a bachelor and a scribe for The Budget. He had lived in different places, most recently Pine Craft, before moving to Montana. Talk about a change in temperatures! Read their story and the obstacles Sadie faces not only with her garden but with trust and sharing her precious seeds with her siblings back in Indiana and with others. Where Healing Blooms by Vannetta Chapman is a story of love, caring and a big secret in the garden. Emma Hochstetter lives with her mother-in-law, the woman she calls maam, Mary Ann….both are widows. Mary Ann is eighty-four years old and had me chuckling at times. Her garden is huge…certainly too big for the two of them. Mary Ann sits on the bench in the garden and watches Emma do the weeding. Danny Eicher was the first boy that had courted Emma. He left the Amish and Emma married and raised a family. Now Danny was back in the community and in his old house….next door to Emma and Mary Ann. He’d loved Emma as a boy and he loved her still. She hadn’t been widowed that long and wasn’t ready for anything other than friendship. One day while Emma and Danny were working in her garden, they spotted a teenaged boy sneaking out of Emma’s barn. It worried Emma since she and Mary Ann lived alone. It was also too cold to be sleeping in the barn. Emma left food for the boy and Danny gave her his English sleeping bag…suitable for very cold weather…to help keep him warm. Did they find out who he was and what he was doing there? Did they gain his trust and respect? An Amish woman in their district was being abused by her husband and the bishop asked Emma to take her and her children in. She had plenty of room in the house. Did she take them in and care for them while the husband got the help he needed? Was her house and garden indeed a place where healing bloomed? Oh the secret in the garden…..Emma and Danny were shocked to say the least when Mary Ann revealed her secret. The way she did it was amusing. What was the secret? Read this page turner for yourself to find out! This is a nice, heartwarming novella collection. Each story is centered around an Amish garden. In Beth Wiseman’s Rooted For Love, Rosemary has been in love with Saul for a long time. They dated as teens and she abruptly ended their relationship, not giving Saul a reason for her actions. In spite of the breakup, her feelings for Saul have continued to grow over the years. An accident brings Saul back into her life, and he’s now helping her to care for her neglected garden. Can the truth be uncove This is a nice, heartwarming novella collection. Each story is centered around an Amish garden. In Beth Wiseman’s Rooted For Love, Rosemary has been in love with Saul for a long time. They dated as teens and she abruptly ended their relationship, not giving Saul a reason for her actions. In spite of the breakup, her feelings for Saul have continued to grow over the years. An accident brings Saul back into her life, and he’s now helping her to care for her neglected garden. Can the truth be uncovered so that Saul and Rosemary can find their way back to one another? In Seeds Of Love, Sadie takes special care of her mother’s heirloom tomatoes, planting all of the seeds. Her mother is dead, and these seeds are precious, her tomatoes have to sprout so that she’ll have more seeds to plant next year. But, trouble stirs with her plants and she doesn’t know if her love interest, Eli, can help her. In Flowers For Rachael, Rachael takes special care of her garden while caring for her sick grandfather. She spends too much time alone, and her grandfather wants her to socialize with other young people. Gideon loves Rachael, and when pretty flowers start popping up in her yard, from a secret admirer, Rachael wonders if Gideon is the culprit. Does he have feelings for her after all? In Where Healing Blooms, Emma discovers a runaway teen in her barn. What is she going to do? A widow, she’s caring for her mother-in-law while resisting her attraction to Ben, who’s recently returned and lives next door. Ben is her old beau, but, he had to leave the Amish country to travel and write articles about his adventures. Now he’s ready to return to Amish country and settle down. He’s got his eye on Emma as a mate, but, doesn’t know if she shares his feelings. Emma is busy, helping those in need while tending to her beloved garden. Does she really want Ben around? I really enjoyed each of these stories. I especially liked the idea of centering each novella around a garden. For an Amish fiction lover like me, this book has it all! It is a collection of four novellas by some of my favorite authors. All of the stories stand independently from each other and since they are novellas, they are faster reads than a standard length novel. However, all four stories are very full and well-developed. I connected with the characters in each of the stories and felt invested in how things would turn out for them. In each novella, a garden is central to the storyline. The themes o For an Amish fiction lover like me, this book has it all! It is a collection of four novellas by some of my favorite authors. All of the stories stand independently from each other and since they are novellas, they are faster reads than a standard length novel. However, all four stories are very full and well-developed. I connected with the characters in each of the stories and felt invested in how things would turn out for them. In each novella, a garden is central to the storyline. The themes of hope and healing, and learning to let go and trust in God completely are woven with sweet romantic stories to make for a very enjoyable collection. I truly loved every single story. I received a complimentary copy of An Amish Garden in exchange for an honest review, which I have given. You can read a more detailed review on my blog and through 3/28/14 you can enter to win a copy of An Amish Garden. "AN AMISH GARDEN" is an absolute must read if you like Amish novels.....and if you have never read an Amish story before, then this is the one for YOU!! All four novels are fantastic! Great writings by four wonderful Christian romance writers, interesting concepts, exciting stories, excellent themes and intriguing characters, and the kind of book you just can't lay down! Each story was absolutely beautiful, it was amazing to see each character grow into who they were meant to be and to watch them find their path along life's winding road. Everyone can relate to something in each story whether it's loss, grief, abuse, joy, love... Each story is full of life, and that's something we all are going through no matter what path we are on. They were each very uplifting fun stories. I enjoyed them. Good story. Rosemary and Saul had dated when they were teens, until Rosemary abruptly broke things off. Now she takes care of her widowed father and her three brothers, and dreams of what might have been. Saul has never given up on the love he felt for her and keeps asking her out. When Rosemary's dad and Saul are injured in an accident, Saul insists on helping out, in spite of his own injuries, hoping for another chance. I loved Saul. He's true in his love for Rosemary and doesn't give up, even when it seems hopeless. His sense of honor insists on him helping out because he was the one who caused her father's injuries. It was a bit amusing to see that he didn't handle his own injury too well. I had a bit more trouble with Rosemary. She doesn't treat Katherine very well because she's jealous of what appears to be the other woman's perfect life. I admired the way that she has taken care of her family since her mother's death, especially since she is often overwhelmed by it all. But she is also a little bitter about having missed out on the husband and children she wants. She is still in love with Saul, but doesn't treat him very well. The reason she broke things off haunts her, and she wonders if it was worth the loss of the man she loves. I got pretty frustrated with her because she was so inconsistent with her treatment of Saul. I was glad to see her talk to her friend about what happened and that it gave her the motivation to actually talk to him about it. When she finally got up the courage to do so, it was to find that it had been a misunderstanding of what she heard. If she had only taken the time to talk to him about it, so much time wouldn't have been lost. However, I liked Saul's philosophical look on the lost years. There was also a secondary story involving Rosemary's dad, Wayne, and Katherine. Rosemary's treatment of Katherine nearly ruined the blossoming of their romance. I ached for both Wayne and Katherine and their unhappiness. I was happy to see Rosemary see her mistakes and try to fix things. Good story. Rachael has come to Ohio to take care of her ill grandfather. When she isn't caring for him she is working in her garden. She's rather lonely because she doesn't allow herself much time away from Eli. However, she is intrigued by neighbor Gideon, though he doesn't seem to share her interest. Gideon is rather shy and awkward around women. His one attempt to ask one out ended badly and he hasn't tried since. He has fallen hard for Rachael, but has no idea how to proceed. Gideon and Rachael have become friends, though each wants more. It was fun to see Gideon's sister get involved and try to help him along. The idea she came up with was pretty sweet and he pulled it off well. It certainly got Rachael's attention as she tried to figure out who was doing it. His shyness almost ended things before they began, but an assist from Eli got things going again. Gideon was still afraid he was relegated to friend, until a crisis with Eli gave him a chance to show Rachael how much he cared. Rachael has spent so long doing everything herself that she has forgotten how to accept help from anyone. Between his help with Eli and then when her garden is damaged by hail, Rachael finally learns that a burden shared is much easier to bear. The ending was really sweet, with Rachael delivering her own floral message. Sadie moved to Montana to escape her overwhelming grief over the loss of her parents and the sometimes smothering attentions of her older siblings. She plants the heirloom tomato seeds that are all she has left from them, hoping to continue the tradition. She meets Eli, a newcomer to the community, who is a traveling writer. Eli has enjoyed his travels, but something about the community feels right to him. Sadie and Eli are drawn to each other and connect over her garden. Nurturing the garden does the same to their feelings. I loved seeing Eli's desire to ease her grief as they worked together. There are some sweet scenes as they cope with several issues. A misunderstanding drives them apart, but a marauding bear and destroyed garden helps bring them back together. Then a message from the past brings peace to Sadie and hope for her future. When Widow Emma Hochstetter discovers a run-away teenager in her barn, and the bishop asks her to provide a haven for a local woman and her two children she finds her quiet life has been interrupted. Then, her mother-in-law, Mary Ann, reveals one of her garden's hidden secrets, something very unexpected. Will Emma continue alone or will she accept the gifts God has given her? Good second chance story. Emma and her mother-in-law have both been widowed within the last year. Mary Ann finds great comfort in her garden, though she can no longer work it the way she used to. That is left to Emma, whose own children are grown with families of their own. She is left feeling a bit at loose ends, wondering what purpose she has now. Also plaguing her is the return of a former beau, whose presence in her life brings back memories of what they once had. Danny left the community as a young man, wandering the country and experiencing life in other towns. He recently returned to the family farm, where he now writes and watches over Emma and Mary Ann. Then Danny and Emma find a teenage boy hiding out in her barn. Mary Ann and Danny suggest they give him refuge, a place where he can feel safe and wanted. Then the bishop asks them to open their home to a woman and two children escaping from an abusive situation. Suddenly Emma has a full house again and a feeling of usefulness. There's also a reawakening of the feelings between herself and Danny. When Mary Ann reveals a long kept secret of her garden, a world of possibilities is opened, if only Emma has the courage to take it. In this stirring novella, we get to read four pieces of great writing from some of the best in the business. Beth Wiseman, Kathleen Fuller, Tricia Goyer, & Vannetta Chapman--these ladies are great at their craft and they have come together in the writing of An Amish Garden, to share it with all of us. See my thoughts on each story below. Rosemary Lantz and Saul Petersheim courted for a very short and abrupt three month period before Rosemary's mothers death. No one really understands why and sweet Saul has waited on Rosemary's heart to once again invite him in, but it has been a slow go as of late. That is until he runs into Walter and injures him by accident and Saul wants to repay him by working on his land. Will Rosemary and Saul come together after all these years? It's what their hearts both long for, since its within their reach again, how will it all play out? Moving along to the next garden adventure we are taken to the garden of Rachael Bontrager has an amazing flower garden that she pours her blood, sweat, and tears into. But even the most happiest people seem to be the loneliest and it is no different in this story. When Gideon Beiler enters her sights it is hard for her to control her emotions. She was convinced that she was the only one with these types of feelings, but that she will soon see is anything but the truth. Gideon Beiler is completely in awe of her but Rachael has a very difficult time separating what she believes she is responsible for verses what God has chosen for her. Eli Plank is a bachelor that travels for his job as scribe of an Amish newspaper and this trip places him in Montana amongst the town of West Kootenai. He hadn't been in town long before it seemed this Amish community was unlike any he had visited. The intermingled with the English, quite freely. The weather there was also a mystery to him because it was still cool in May. The community children loved him it seems and had a lot to tell him about the area. But really he seen something, or should I say some that interested him even more and that was Sadie Chupp. She hadn't had it easy in her young life and Eli wants to know why. Emma, recently widowed, lives with her mother in law Mary Ann. Mary Ann's pride and joy is her garden. Mary Ann uses her garden as a place of teaching for Emma and for the healing that Emma seems to desperately need. Both ladies, not spring chickens anymore, have been living together and relying on one another for some time now. One day Danny, a very longtime family friend, that has always been sweet on Emma drops in. And for a few minutes everything is fine and going along nicely until Emma spots a young boy sneaking out of her barn. Soon the mystery is solved, but what Emma doesn't realize is, is that she will still have a hand in helping this young boy and his family. So whatever this is about, is not over by a long shot. Soon spring will have sprung and in typical Amish fashion these lovely ladies have come together and provided something for us to enjoy while we tend to our own spring gardens. Each story is woven with simplicity and enraptured with romance. All four of the stories included in this novella will have you longing for the gentle breeze blowing across your face and the sweet smell of fresh, green grass between your toes. GREAT BOOK FOR THE SPRING AND SUMMER TO READ! 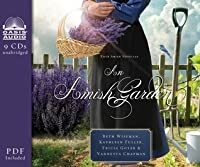 An Amish Garden was written by four amazing Amish fiction authors, Beth Wiseman, Vannetta Chapman, Kathleen Fuller, and Tricia Goyer, whether is it a collection of novellas in a book or their individual books, a reader can not go wrong in selected any reading material from them. 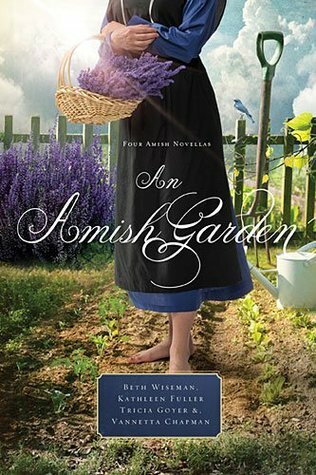 What a cute short story Rooted in Love: An Amish Garden Novella was by Beth Wiseman. Any reader should be able to relate to this story. Your heart lo GREAT BOOK FOR THE SPRING AND SUMMER TO READ! Any reader should be able to relate to this story. Your heart loves the other person you want to spend the rest of your life with, but can you get what you heard out of your mind and get your mind on the same page as your heart? Five years Saul has waited for a second chance with Rosemary. Rosemary has had a life event that changed her life since she called off her first relationship court with Saul, but she's hold a secret from him that was her reasoning. Can she tell him the secret? Will they have a second chance courtship? Ladies!! Do you need something for the man in your life to get the hint that you want him to romance you? Then Flowers for Rachael: An Amish Garden Novella by Kathleen Fuller is your answer; it is a short story for him to read. All the stories in this collect, An Amish Garden, may also help. Although, this one really gets to the point and you yourself can even do this, too. I was so engrossed by this story that I did not want to see it end. More importantly I wanted to know what happened to the one animal in the story; I know, I know an animal c'mon you are to be more worried about what happens to the main characters who are human. In Seeds of Love: An Amish Garden Novella by Tricia Goyer, she sends us back to West Kootenai, Montana with new bachelors in this short story. The biggest message in this short story was Trust and "'For whoever wants to save their life will lose it, but whoever loses their life for me and for the gospel will save it. '"* Tricia Goyer quoted from the Bible. Sadie Chupp has relocated herself from Indiana to her Uncle, Aunt, and cousins' place in West Kootenai, after her sisters sold their parents property. Sadie brought with her her mother's special heirloom tomatoes, that have been passed down in the family for generations. Eli Plank is the new bachelor to the area of the area. He comes from a family business of gardening and is a scribe of The Budget as he travels to Amish communities. After a morning of misunderstanding in the presence of her cousins, he immediately befriends Sadie to help her with her tomato garden since Montana's climate is different from Indiana's. When a visitor from the past comes to visit West Kootenai, Montana, will Sadie still trust Eli? Will all be lost? I cant tell you the answer to those questions, you'll have to get the book to find out. And trust me, get the whole novella collections An Amish Garden you will be glad you did. *Goyer, Tricia (2014-03-18). An Amish Garden (p. 279). Thomas Nelson. Kindle Edition. Where Healing Blooms: An Amish Garden Novella by Vannetta Chapman was different, in a good way, than most Amish books that I have read, but don't let that fool you. The main two characters are two widowed women, related by marriage. Daughter-in-law, Emma and mother-in-law, Mary Ann live in the same house that they have shared since Emma married into the Hochstetter family. Now it is just the two of them taking care of each other and the property. The neighbor man, Danny Eicher, whom is friend of the family, keeps a helping eye on the two of them and helps in the garden. But is there someone else on the property? This is a collection of four different Amish stories that have the common theme of gardening. As the reader is led down the garden path in this book, one will discover that each tale is unique. The stories are: "Rooted in Love" by Beth Wiseman, "Flowers for Rachael" by Kathleen Fuller, "Seeds of Love" by Tricia Goyer and "Where Healing Blooms" by Vannetta Chapman. The story of Rosemary and Saul is of love at cross-purposes. The two had courted as teenagers, and seemed to be in love. Then one day This is a collection of four different Amish stories that have the common theme of gardening. As the reader is led down the garden path in this book, one will discover that each tale is unique. The stories are: "Rooted in Love" by Beth Wiseman, "Flowers for Rachael" by Kathleen Fuller, "Seeds of Love" by Tricia Goyer and "Where Healing Blooms" by Vannetta Chapman. The story of Rosemary and Saul is of love at cross-purposes. The two had courted as teenagers, and seemed to be in love. Then one day, out-of-the blue, Rosemary said the relationship was over. Saul had given his heart to her, and no one else has ever been right for him. Saul stills pursues her to no avail. The big question is, why did Rosemary call it off? Years pass and she still won't tell him. Even if Rosemary never goes out with him again, Saul needs the answer for his own peace of mind. Will he ever get it? Hard working Rachael has left her home to nurse her grandfather back to health. She also spends a good deal of her time gardening to supply them with food to eat, as well as, items to sell to supplement their meager income. She doesn't spend any time on social activities. Gideon admires Rachael from afar. The one and only time he attempted to ask a girl out, she laughed at him. That was years ago, and he has never tried again. Can shy Gideon get the courage to tell Rachael how he feels about her? What will her answer be if he does? Heirloom tomato seeds are all that Sadie has left as a heritage after the death of her beloved mother and father. The seeds have been carefully saved after each harvest by her mother, and the generations before her. Now it was up to Sadie to plant them, and keep the tradition going. After moving across country, she attempts to grow them in soil and a climate she is not used to. Despite her unfamiliarity with the area, she throws caution to the wind and plants every single seed--saving none of them. Eli offers his extensive garden knowledge to help her. He is hoping working together will lessen Sadie's grief, and bring the two of them closer. But will she reject him when Sadie finds out the truth about Eli's heritage? Was Sadie mistaken to plant all of the seeds without holding some back as a "safety net?" Emma is a 50-year-old widow, who is taking care of her elderly, widowed mother-in-law, Mary Ann. Emma feels empty with her children grown and her husband gone. She is also overwhelmed by the enormous work involved in caring for the huge garden Mary Ann insists they keep. Then Emma discovers a runaway teenage boy has been sleeping in her barn, Mary Ann gets hurt in the garden and a new love might be sprouting in Emma's life. Will the garden be a place for both plants and people to be nurtured? Will Emma's love and loneliness for her deceased husband hold her back from growing in new ways? I thought all of these tales were very entertaining, and each one included faith in God. It was enjoyable to have a different "voice" in each work. This book has four stand-alone Amish stories and they all have a garden theme, but that is where the similarities stop. The authors have all gone their own direction with each one. The first story has a bit of a mystery concerning why Rosemary ended the relationship despite still loving Saul and vice versa. The tale of Rachel and Gideon is a tender and sweet love story. Eli's other job as a traveling writer added an unexpected twist and a lot of interest to "Seeds of Love," along with some humor. I liked that the last story featured senior citizens as the main characters. That is a different age group than fiction normally centers on, and it added a refreshing addition to that tale. It also dealt with issues one rarely hears about occurring in Amish communities. Although this is fiction, it shows that the Amish, like everyone else, must deal with living in a fallen world--and the unhappy situations that can sometimes result. However, the solution this story gives has a distinctive Amish flavor. This collection of stories involving gardens can be enjoyed anytime of the year, however, it is especially apropos to read it now, in the spring-time, when gardens are beginning to grow. I recommend this 5-star book to anyone who enjoys Amish fiction. This was a beautiful book with stories I wouldn't have thought of when I read it was about gardens. I really liked the clean romance and of course the recipes! This wonderful book, which entails four Novellas, written by four wonderful authors, shows how the gardens in our lives help us to move ahead and as stated in the final novella by Vannetta Chapman, Gardens will bless your soul. “They are a place to rest, to draw near, and to heal.” I especially loved that line and marked it as I was reading the book, because that is how I truly feel about gardens, as well. Rosemary Lantz is the main character in this story. She is a talented young woman except that gardening has its challenges for her. In her courting days, she was together with Saul until she hears a secret about him that at her age of 16, causes her to separate from him. This was a hard thing for both of them, but Rosemary knows that a life with Saul under these circumstances would never work for her. As they begin to work together in her garden, they share work and laughter together. I especially liked the interaction with Rosemary and her father and there was a part that brought me to tears as I read the feelings between the two of them. Rachael has a beautiful flower garden and spent most days tending to it. She loves her garden and even finds herself talking to her flowers, perhaps because she is lonely. She apparently has a secret admirer, however, as suddenly and daily, a beautiful flower appears for her with a very short note. She has no idea who is bringing the flowers, although she hopes it might be Gideon. Yet, it appears not to be as he seems unaware of the flowers’ meanings when she gives a flower to Gideon. Rachael cares for her grandfather and finds him collapsed one day, which leads to a hospital stay and Rachael feels she needs to be her grandfather’s caretaker. Her grandfather insists she needs to tend to her life and that God will take care of things all in their due time. Rachael still is worried about her grandfather but discovers that she must learn to trust. This novella takes place in Montana and the main character is Sadie Chupp who is a young woman whose late mother left her with a legacy, heirloom seeds that are her special remembrances of her dear parents. She seems to harbor some unhappy feelings towards her siblings, who, after the deaths of their parents, sold the family home. Sadie being the youngest was heartbroken and moves to her uncle in Montana to start fresh. She brings her mother’s seeds and plans a garden to continue to keep the feeling of her parents close to her. A company has wanted to buy the heirloom seeds, but Sadie’s mother had not wanted to do so, because the seeds had belonged to her family for generations. She meets Eli who wants to help her with her gardening. As time passes she and Eli have a misunderstanding and Sadie is beyond sad. Her garden undergoes lots of damage and the heirloom seeds have all been planted. How will she ever be able to repair the damage that a bear cub has done? The biggest surprise yet occurs when Sadie meets Eli’s grandfather. Emma is a widow who lives with Mary Ann, her mother-in-law. Mary Ann has a beautiful garden that she lovingly tends. Emma tries to find a purpose in life now that her children are grown. She learns that a runaway Amish boy has been hiding in her barn. She tries to know how she can help him at this troubled time of his life. She leaves food and hopes that he will feel that he can trust her to help him. She also is asked by the bishop to house an abused Amish woman and her two children. They find a safe refuge at Emma’s and begin to work together. Her old friend, Danny, has returned home after many years absence. She had once hoped that they would marry, but Danny had disappointed her by moving away to pursue his life’s plans leaving Emma alone and to marry another. Emma feels she is too old now to find love again in her life. Mary Ann’s garden holds a secret which she reveals to Emma and Danny that may just change both of their lives. These four stories will touch your heart. These four authors share how gardens can help you find peace, faith, endurance, hope and healing. I loved them all! I received a copy of this book from the publisher to give my honest review, which I have done. This is an Amish novella, four-in-one book: Rooted in Love, Flowers for Rachael, Seeds of Love and Where Healing Blooms. A garden theme is sewn throughout each story. Hope, healing, challenges and trusting in God are woven throughout the stories. Rosemary Lantz had dated Saul Petersheim when she was 16 but broke off their courtship without giving him the real reason why. Now five years later she finds that Saul is still interested in her and she is not sure what to do about it. Her heart longs for him but the secret she carries keeps her from following her heart. Anyway she has much to do caring for her dad and siblings since her mother's death years ago. And then there is the vegetable garden that she just can't seem to master. Their neighbor, Katherine, comes over each week with produce from her vegetable garden to share with them. However, Rosemary wonders what the real reason is for her frequent visits. Saul doesn't plan to give up on Rosemary, she is the only one for him. It seems her father, Wayne, is agreeable to the match. But how to get Rosemary to talk to him and work things out? What secret does Rosemary keep? Secrets are revealed, misjudgments, eavesdropping can lead to wrong conclusions and heartache; but healing, forgiveness, faith and trust is possible. Lovely story. A year ago Rachael Bontrager moved from Indiana to Middlefield to care for her grandfather after his stroke. Each day she works lovingly in her flower garden producing a beautiful garden. Gideon Beiler is a neighbor who is very much interested in Rachael from the first day he met her. He wants to court her but is not sure how to go about asking her. What if she says no to his courtship? His sister, Hannah decides to help him in his pursuit of Rachael, but things don't go well. A little matchmaking, secret admirer, faith and love all produce a beautiful story. Eli Plank is a bachelor scribe for the Budget, an Amish paper. He travels around the Amish community and writes articles for the paper. He comes to West Kootena, Montana for his next stop and meets Sadie Chupp. He finds her interesting and may plan on staying awhile in Montana. Sadie has only been in Montana for five months. She has heirloom tomato seeds from her mother that have been passed down for generations and needs to learn the weather and soil conditions in her new home before planting them. She starts them out in a neighbors greenhouse in preparation for planting. As in life, the characters must work through misunderstandings, challenges, trust, love and faith. A beautiful story. Emma Hochestter and her mother-in-law, Mary Ann share a home in Shipshewana, Indiana. Both of their husbands have died, but Emma's grown children live close by. They spend a lot of time in the large garden, a place of healing in many ways for the two women. One day Emma notices a young teenage Amish boy running from behind her barn. She discovers he has been sleeping there. Where has he come from and what should she do about him? The bishop asks Emma to take in a woman and her two children and provide a safe haven for them for a time. Mary Ann has a secret hidden in the garden and finally shares it with Emma. Emma is shocked at the discovery and ponders what to do. What does God have in store for these two women and their garden? What a delightful story. I love the relationship between Emma and Mary Ann and the way the characters lives are impacted by each other. Even though this is a short story there is so much packed into it: hope, healing and learning to trust God in their lives is sewn throughout making this an enjoyable read. Would like to see a follow up story of the characters. MY REVIEW of Planting a Future by Beth Wiseman--"He's doing it again," Rosemary whispered to Esther. "Smiling and staring at me." Rosemary and Saul are being offered a second chance at love and so is Rosemary's father, Wayne. When an accidental run-in between Saul and Wayne results in both men being injured, Wayne is unable to complete his farm work and Saul offers to do it for him as well as planting a vegetable garden for Rosemary. Rosemary hasn't had time for planting a garden since her mamm MY REVIEW of Planting a Future by Beth Wiseman--"He's doing it again," Rosemary whispered to Esther. "Smiling and staring at me." Rosemary and Saul are being offered a second chance at love and so is Rosemary's father, Wayne. When an accidental run-in between Saul and Wayne results in both men being injured, Wayne is unable to complete his farm work and Saul offers to do it for him as well as planting a vegetable garden for Rosemary. Rosemary hasn't had time for planting a garden since her mamm died and she has had to bear responsibility for her brothers, daed and the home so Saul and Rosemary will be thrown together quite a bit. This is a 5-star novella and really kept me reading and cheering the couples on! Read to see how misunderstandings can mess things up for couples until they are resolved. Gideon and Rachael both care for the other and they're both afraid to express it. Rachael is living next door to Gideon while caring for her grandfather, Eli, who suffered a stroke. Rachael loves flowers and soon a secret admirer is sending flowers daily with one word notes attached to them. She hopes it's Gideon. Will he be the one who is secretly sending flowers ? if not Gideon, who is sending them? This is another 5-Star Novella that is simply delightful. I learned many new things about plants and flowers as I read this work of Amish fiction. MY REVIEW of Seeds of Love by Tricia Goyer---Can planting and tending tomatoes lead to love for a grieving young Amish woman and the Amish bachelor? or is it simply too far-fetched an idea for these two who seem to be doing fine on their own? Poor Sadie Chupp worries too much about what her sisters think about her life and plans. She needs to learn to listen to her own heart. Eli Plank is having an incredible time travelling around the country and writing as the scribe "The Amish Bachelor" for The Budget, an Amish newspaper which includes little stories of interest from many Amish communities in the world. Another 5-Star Novella!!!! Wow, I have been having such a great time reading these works of Amish fiction and romance and learning so many new things for a self-proclaimed "brown thumb". MY REVIEW of A Place of Healing by Vannetta Chapman---This last novella in the book may have touched the most nerves with me as I am also an empty-nester in my early 50's like the main character, Emma. Danny and she dated a long time ago and went their separate ways for Danny to travel, research, and write and for Emma to marry and raise a large family. Emma is now a widow and Danny has returned permanently and is living next door. Will they be able to put the past behind them and begin a new future and start a new ministry? or will they stay stuck in the past? This one is another winner and another 5-star novella to finish the book. All four novellas are wonderful and I highly recommend this book to fellow readers as it has something for just about everyone. Get a copy and give it a try! I don't think you'll be disappointed. I was excited to see this book - several of my favorite authors, and a subject that is dear to my heart - and it did not disappoint! In "Rooted in Love," Beth Wiseman shows the age-old cost of eavesdropping. Will Rosemary miss out on the love of her life because she thinks she knows what's best for her future? The chemistry between her and Saul is true to life. I couldn't put this book down as I ached for them to experience God's best. In "Flowers for Rachel," Kathleen Fuller writes a love story o I was excited to see this book - several of my favorite authors, and a subject that is dear to my heart - and it did not disappoint! In "Flowers for Rachel," Kathleen Fuller writes a love story of shy and awkward Gideon and Rachel. Each chapter begins with a quote related to flowers, and they nicely summarize the growing relationship between these Amish young people. I felt this story was a bit predictable, but I like the ways the characters learned to show their love for one another. Tricia Goyer gives us another glimpse into the Amish community of West Kootenai, Montana in "Seeds of Love"(If you haven't read her "Seven Brides for Seven Bachelors series, or the "Big Sky" novels that preceded those, this is a good excuse to start!). Sadie Chupp and Eli Plank are strangers who meet in a small Amish settlement when he travels west seeking adventure...or are they? It turns out their families knew each other in Indiana, and the connection wasn't always so friendly! Eli is a scribe for "The Budget," an Amish newspaper featuring letters from writers living in scores of different Amish communities. His wit and skills of observation make him well-suited to handle Sadie and her reservations. As usual, Goyer has a few twists up her sleeve, and gives a satisfying ending to this garden tale. Beth Wiseman has written a poignant Amish story of love and loss based on a conversation the main character overheard. Two people's lives are fraught with dismay that honesty, openness and trust would have assuaged. The author paints a realistic portrait of Amish life, creating characters with emotion and sensitivity. I enjoyed this short story of relationships and the developments that resulted despite a misunderstanding. Kathleen Fuller has depicted Rachel and Gideon's friendship in a very tender and expressive perspective. The Amish lifestyle is well described, and Rachel's relationship with her "grossdaadi" is amusing and entertaining. The author used very touching quotations at the headings of each chapter, appropriate to the content and very thought provoking. I enjoyed that addition to the story. The development of Rachel and Gideon's relationship was very charming and endearing. Considerable loss and loneliness are pivotal factors in the life of Tricia Goyer's protagonist. Life-changing events set the mood for this expressive narrative. Heirloom tomato seeds are all that remain from Sadie's past, and a misunderstanding affects her attitude toward immediate family members. The young man depicted in this story is presented with compassion and a depth of character. The events throughout this novella are heartrending and poignant, and misconceptions are emotive. Spring has arrived in Shipshewana, and Mary Ann's garden is once again her haven. Her daughter-in-law, Emma, joins her in weeding and tending to the garden, more expansive and prolific with each passing year. The garden haven holds secrets that no one could suspect. Vannetta Chapman weaves a story with depth and perception that places her in a category all her own. Her characters are strong and the setting picturesque. There's no guessing the ensuing events in this well-written novella. Much diversity is revealed in this extraordinary short story and I craved more, but the author wrapped up all loose ends bringing closure to this impressive novella. Faith, hope and love are strong elements in each of these novellas, and God's timing is always perfect, making for four well-written and very enjoyable novellas in this compilation. I highly recommend this collection of Amish garden stories, each containing very enjoyable story lines in their own right. Beautiful cover and fantastic book! Of course, the stellar author lineup guaranteed a good read. There is no doubt that Emma loved her husband but he is gone now and all of Emma’s children are grown. Alone, except for her aging Mother in Law, Emma struggles to find new purpose in her life. With the discovery of a runaway teen in her barn and the return of her first love—Emma must make a decision about what she wants from life. Gideon has fallen for Rachael but he’s too shy to tell her. His sister cooks up a scheme to get Rachael to notice him but his plan backfires. This was a super sweet story about how it is best to be ourselves and that we can miss God’s will for us when we try to be something we aren’t. Sadie’s parents have died in a buggy accident and she moves to Montana to live with relatives. All that she has to remind her of her parents are her mother’s heirloom tomato seeds. Eli is a bachelor who is interested in Sadie but will he be able to help preserve her family’s memory and win her heart? Rosemary has been in love with Saul for as long as she can remember. A dark secret got in their way though and Rosemary has kept it hidden from him for a long time. Still, he pursues her and though her heart aches to be with him—this secret looms over their relationship. At the end, Rosemary has to decide where her heart truly lies and if her love for Saul will outweigh other desires. I thought each novella was fantastic. I think Flowers for Rachael was my favorite out of the four but I enjoyed each of them. If you’re looking for a quick read and love Amish fiction—I would suggest this one. 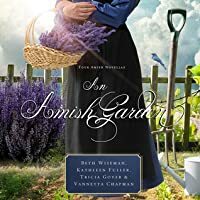 An Amish Garden is a collection of four novellas by Beth Wiseman, Kathleen Fuller, Tricia Goyer, and Vannetta Chapman. I enjoyed all of the stories, but I think my favorite one was Flowers for Rachael. It was a fun, sweet read, but the other three novellas were a close second! It's unusual to enjoy all the stories so much, but I did. Each story pulled me in from the beginning and reluctantly let me go at the end. Rooted in Love by Beth Wiseman is about Rosemary Lantz who has the responsibility o An Amish Garden is a collection of four novellas by Beth Wiseman, Kathleen Fuller, Tricia Goyer, and Vannetta Chapman. I enjoyed all of the stories, but I think my favorite one was Flowers for Rachael. It was a fun, sweet read, but the other three novellas were a close second! It's unusual to enjoy all the stories so much, but I did. Each story pulled me in from the beginning and reluctantly let me go at the end. Rooted in Love by Beth Wiseman is about Rosemary Lantz who has the responsibility of her three younger brothers and her dad's household ever since her mother died four years ago. She is just barely making it all work and wishes she didn't have to break up with the only man she ever loved, Saul Petersheim. When Saul starts helping her put her garden in, she begins to question her resolve to give him up. Flowers for Rachael by Kathleen Fuller centers around Rachael Bontrager. Rachael has been helping her grandfather for the past year and ever since she met her next door neighbor, Gideon, she has been attracted to him. But for some reason, he is always aloof with her. Why does he help her when he won't even talk to her? Seeds of Love by Tricia Goyer is set in a Montana Amish community. Eli Plank has been traveling around the country visiting different Amish communities and writing about it all for the Budget, an Amish newspaper. When he meets Sadie, he helps her plant her special heirloom tomatoes in the harsher, colder climate. Those tomatoes are all Sadie has left that was her mother's, and she is determined to make them grow. Then disaster strikes, and Sadie immediately runs to Eli for help. Will he be able to help the tomatoes rebound? Where Healing Blooms by Vannetta Chapman centers around widowed Emma Hochstetter and her mother-in-law, Mary Ann. Emma's children are all grown with homes and children of their own leaving her in a big house with a big garden and lots of memories of what used to be. But when she discovers a runaway in her barn, things begin to change for the better. I loved that these stories revolved around gardening, and I read it at the perfect time, too - when I was starting my garden! Can't get better than that. :-) Everything is beginning to bloom around here making it the perfect time to read this collection. Go grab a copy and rejoice that spring is finally here! An Amish Garden is (4 short stories) by Beth Wiseman,Kathleen Fuller,Tricia Goyer&Vannetta Chapman. If you like to read about the amish and plain people you are going to enjoy this book so much. short stories are nice every now and then because you can read the "whole" story quickly and know "The end" right away. I met so many wonderful characters in these stories and every author writes a great story. Beth wrote "Rooted in Love" this story is of RoseMary who does not like to garden, she is a s An Amish Garden is (4 short stories) by Beth Wiseman,Kathleen Fuller,Tricia Goyer&Vannetta Chapman. Beth wrote "Rooted in Love" this story is of RoseMary who does not like to garden, she is a self made woman who tries to do it all without any help. Saul has loved her for years but she wants nothing to do with him for a Beau. She always says NO and yet he continues to ask. Kathleen writes "Flowers for Rachel" Rachel Loves flowers but she is lonely and talks to her flowers all the time...Gideon wants to help her and is usually around whenever she needs it. Tricia writes "Seeds of Love" the story of Sadie and Eli Plank. Sadie has moved to Montana community and brought her mothers heirloom seeds for tomatoes. she is very protective of them and ask to use greenhouse next door that is vacant to start her seeds. Eli is a traveling batchelor and when he meets Sadie and sees how hard she works and her love of the gardening he falls for her immediately. He knows in his heart his traveling days are over. Vannetta writes of Widow Emma and her mother in law that have become so close they are like two peas in a pod. Mary Ann loves the garden it seem more then Emma but cannot do the work now that she is older and frail, she loves to sit on a bench in the garden and watch Emma working. Ben was Emma's beau when she was a young girl but he left the community and she married and had a family and was content until she lost her husband in the last year. Ben returned just before his friend died and now wants to help whenever help is needed at Emma's place. They both have tender hearts and when a young man (Runnaway) hides in the barn they both want to help him. This collection of garden themed stories has many of the best Amish romance author contributing. Each novella takes you to a different Amish settlement with the characters finding love through life's challenges. Beth Wiseman's "Rooted In Love" opens the book. Rosemary has been taking care of her family and putting of stepping out with Saul for years, because of something in her past. I felt terrible for Saul because he loved her all of those years when she had a misconception about something. I a This collection of garden themed stories has many of the best Amish romance author contributing. Each novella takes you to a different Amish settlement with the characters finding love through life's challenges. Beth Wiseman's "Rooted In Love" opens the book. Rosemary has been taking care of her family and putting of stepping out with Saul for years, because of something in her past. I felt terrible for Saul because he loved her all of those years when she had a misconception about something. I also felt bad for Katherine, who loves Rosemary's father. Rosemary does a little too much thinking of herself, but as she becomes more accepting her life starts to change. "Flowers For Rachel" was probably my favorite of the three stories. Rachel is the caregiver for her grandfather who suffered a stroke. She's a bit too protective of him and some of the clashes between the are quite fun. Then there's Gideon who has set his cap for her, but just doesn't quite know how to tell her. There's a lot of mis-communication but there will be a happily ever after for these two that will give your heart warm fuzzy feelings. Tricia Goyer is one of my favorite Amish writer's and I really enjoyed Sadie and Eli's story. Eli writes for The Budget and his letters/articles really make the story, along with a yearling bear, the folks call Goliath. Eli and Sadie's romance involves tomatoes and the seeds given to her by her mother, who passed away. I was a bit disappointed in her behavior towards Eli's Opa, but I was pleased with how everything worked out in the end. "Where Healing Blooms" is Vanetta Chapman's contribution to the book, and she deliver's something different. Emma is a widow and Danny is her former beau, who come together when they discover a young runaway in her barn. I loved reading about more mature characters and I especially loved Emma's relationship with her mother-in-law, Mary Ann. Four of my favorite authors have gotten together to write a book of four individual stories. Each story has a different setting, in Amish Communities. One theme is prevalent in each of the stories, and that is gardening. I read my book on my kindle and each story was just about 25%, so you could read a little while and actually have time to finish and know the ending quickly. Of course, having read most all the books by these authors, I am familiar with the communities they reside in. Loved bein Four of my favorite authors have gotten together to write a book of four individual stories. Each story has a different setting, in Amish Communities. One theme is prevalent in each of the stories, and that is gardening. I read my book on my kindle and each story was just about 25%, so you could read a little while and actually have time to finish and know the ending quickly. Of course, having read most all the books by these authors, I am familiar with the communities they reside in. Loved being back in each of the places I have loved reading about previously. First novella is by Beth Wiseman, Rooted In Love, and a garden plays a big part in this love story. We also find that we should not be listening to conversations that we have no part in! The second story by Kathleen Fuller, Flowers for Rachael, we meet a young but very independent Amish woman, learns a big lesson. This one is so very sweet, but not everything is the idea of the person doing the deed. Oh my, I love these! Then we have Tricia Goyer, Seeds of Love. We are back in beautiful Montana with the bachelors, and this time we have one who travels around writing for the Amish paper The Budget. In this rather cold climate, where we have Rachael and her mother’s heirloom tomato seeds, while trying to accept the tragic death of her parents. The last, but equally good, is Vanetta Chapman’s , Where Healing Blooms. Here we have a few generations of strong Amish woman, and a neighbor Amish man who has spent his life traveling among communities. I adored the interaction and the caring these people showed for each other. Some good lessons here of respecting your elders, and showing compassion to others. This story can bring you to tears, so have some tissues handy. I really recommend this book as a great read, and a wonderful way to read and a great way to travel around to different Amish communities. I received this book from the Publisher Thomas Nelson through Net Galley, and was not required to give a positive review.